As a teacher, I often feel the intense pressure to push the goal of going to college on my students. We talk about College Preparedness, College Readiness, College and Career Planning. We take field trips to colleges, and give middle schoolers career interest assessments. While college is a worthy goal, and I am extremely thankful for my own college education, I think that we can all agree that college isn’t for everyone. There is a plethora of votech programs that offer the ability to obtain a well-paying job – a welder makes more money in a year than the average teacher, and many of us have advanced degrees! 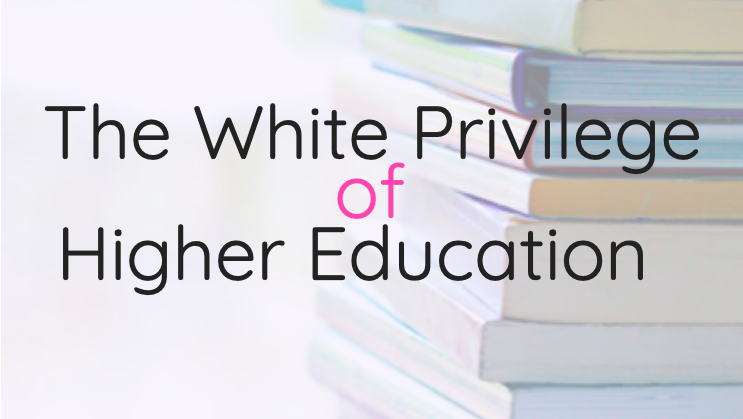 But what has become more conflicting for me is this question – as an educator, is putting college on a pedestal simply exerting my white privilege over my students? I teach in a very small migrant farm town where most of our students are immigrants or first generation children of immigrants. Their parents work on farms picking vegetables or doing other farm-related jobs. These jobs often require long hours, hard labor, and low wages. Many students go home and care for younger siblings or go to work themselves alongside their parents. Students will often tell me that they don’t need school because they are going to work in the field, get a job as a crew leader, or work for their uncle who is a crew leader. Without thinking about it, I used to often respond by telling them that working in the field is a terrible, hard life, and that they need to get an education so that they can do something better. But lately, I am wondering if this good educational practice, or if it’s symbolic of my privilege as a white American. Growing up in the suburbs of Washington, D.C., I was fortunate to go to some of the best schools in the country. My graduating class was so successful that the top 30 had to be decided using weighted GPA’s down to the thousandth of a point; more than 30 of our nearly 300 seniors had a 4.0. Most of us went on to attend state colleges; it was a no-brainer. It was part of the plan that had been established for us since we were born. Of course we would all go to college. We were (mostly) upper-middle class white kids - it’s what you do. But think about a kid who was born in a rural village in the mountains of Guatemala and speaks an indigenous Aztec language that only 0.35% of the population of Guatemala speaks. His family lives in a small hut and works on the village farm. He has never even seen a computer. Suddenly, that kid finds himself in an American public school. His parents get jobs working on an American farm picking vegetables and they make more money than they could have dreamed of in Guatemala. Instead of living in a hut, they live in a trailer. They no longer face the threat of violence and the effects of a slowly-drowning economy. The kids get to go to school and learn how to read, something that was not previously available to them. But at school, the teachers tell them that picking vegetables in a field is an unacceptable way to earn a living. That if they work hard enough, they could get a college education and do better for themselves. I was guilty of saying all of those things, but then I stepped back and considered what I was actually saying when I did. What I’m actually saying to them is, the life that your family lives is not good enough. Their hard work is in vein. Their accomplishments are unimportant.I am putting myself on a pedestal simply because I have a college education – an education that millions of white, middle class kids in this country obtain every year. There’s a great scene at the end of the movie Spanglish (which, if you have never watched, you should, and if you watched it and hated it – watch it again. There’s a ton of nuance that you may have missed) where the Mexican mother who works as a housekeeper says to her daughter “is what you want to be so very different than me?” In other words, what is wrong with being like me? What is wrongwith working hard and making an honest living? What is wrong with not achieving the white American status quo of a college education? Because coming to America, making more money than you dreamed of where you came from, having the ability to give your kids an education, and putting a roof over their head is an accomplishmentfor many families. Those jobs that we consider to be the menial labor of the loserswho didn’t “reach for the stars” provide families with an honest living. By telling kids that their family’s accomplishments are invalid because they do not align with our world view, we are diminishing them as human beings. Conversely, we don’t want the pendulum to swing in the opposite direction where we present college as a pipe dream that is only attainableby privileged white kids. College should be attainable for allkids – if they want it. As educators, we should spend more time supporting what our students want to get out of their lives, and less time pushing our own agendas. There is a significant difference between presenting the options to students, and telling them what they shouldwant. I want my students to be successful. Success looks like different things to different people. My job is to support and encourage their goals, regardless of what they are. So now, instead of telling my students that their goal of being a field crew leader is not “thinking high enough,” I tell them to be the best crew leader that they can be, and to start practicing that by putting their best effort into their schoolwork. Because while their goal might not be for them to go to college, the skill of hard work can be taught anywhere. Work hard in my class, work hard in school – and you will know how to work hard someday when you are a crew leader.